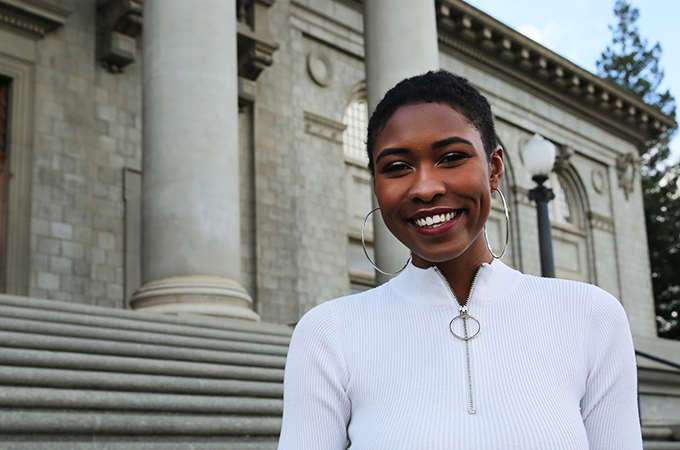 Noelani Pierce, a sophomore food science and biology major from Chicago, Illinois, says she was initially attracted to the exchange program because of the new experiences it offered. Throughout her childhood and into her teenage years, Pierce worked with a number of sustainable living and agricultural programs, which led to an interest in food science. Tuskegee’s program integrates chemistry, physics, biology, and math as they apply to food and the human body. As a whole, Tuskegee is known for its STEM programs, which graduate a large number of aerospace engineers and environmental scientists, in addition to food scientists. At Redlands, in addition to working with chemistry and biology faculty members, Pierce has found a home within the Johnston Center for Integrative Studies community and has enjoyed getting to know Professor of English Priya Jha during her literature course. With a goal of making as many connections as possible, she plans to get involved in Campus Diversity and Inclusion and the sustainable University of Redlands farm. U of R Study Abroad Director Leo Rowland, who was instrumental in forming the Redlands-Tuskegee agreement, is looking forward to other opportunities to leverage the partnership. In addition to having Redlands students and faculty study and teach at the Tuskegee campus, three Tuskegee students will embark on a study abroad trip with University of Redlands students during the upcoming May Term. The three-week-long trip, which will be funded by a diversity grant from the Institute for the International Education of Students (IES), will enable participants to explore London, with a focus on storytelling.